Macaroons– I’ve visited France twice and I’ve never tried these. I’ve always thought they would be hard and crunchy all the way through, but now that I’ve seen how they are made, I definitely want to try them now! Slurpees– DONE! I’ve actually tried these in Mexico the last time I visited and they are exactly what I imagined! I’ve tried a cherry flavoured one and a blueberry one, so I can’t wait to go back and try more flavours. Pickles– Now the only time I’ve had pickles is when they are on a McDonalds burger, and they are horrible! But I always wondered is that what all pickles taste like, or are they different. Apparently everyone in the US loves them, so I’d like to see what the fuss is about. Skiing– I’d love to try skiing. I sometimes think ‘Maybe I’ll be a natural at skiing, I’ll just get on the snow and I’ll be naturally good and will have a great talent for it’. Haha that’s what I think anyway! I’d like to see if that’s actually true! A dog– I’m mad to get a little dog, but at the moment it’s just not possible. Not knowing where we are going to live after China and what our plans are, we don’t want to have a dog with us and having to worry about paying for flights for it. When we are settled then we’ll get one. A coffee maker and proper coffee– I enjoy drinking coffee, and I would love to buy a fancy coffee maker/ press and good quality coffee. If I had lots of money, thats what I would indulge in. It makes all the difference when it’s good coffee! An Instant Pot– I’ve read online that these things are brilliant. With me being a bad cook, and the fact that I don’t particularly like cooking….. I think I would definitely use this. A Good Pair of Expensive Boots– My Mum bought me a good pair of boots about 7 years ago, and I still have them today. I’d like to get another pair, as I feel that buying a good quality pair of boots will last you for years. Maybe in a few years I will tick some of these off! Here are a few differences which I found between Chengdu and Xiamen. Because Chengdu is situated in the West of China, while Xiamen is in the East, it has a more Westernised feel to it. People walk much faster in Xiamen. 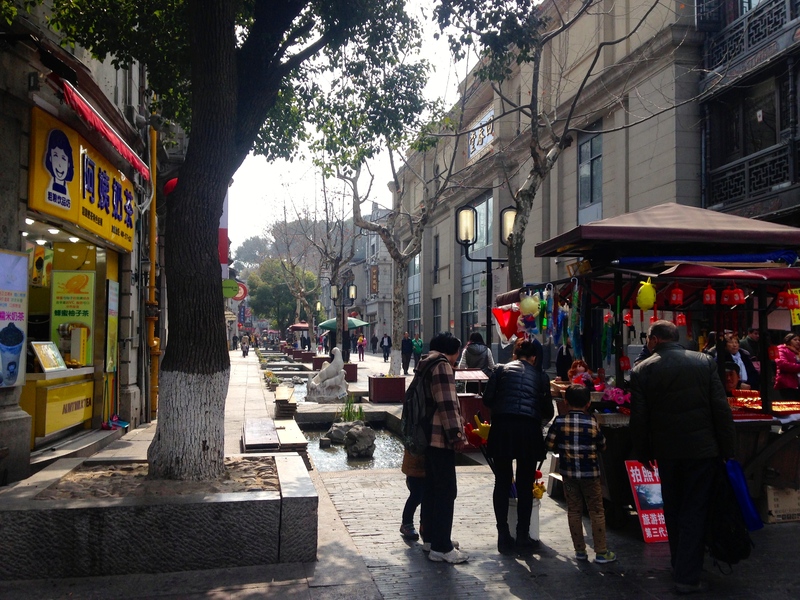 Chengdu is known as being a relaxed city… they actually walk too slow sometimes! Because Chengdu has an army of street cleaners and sweepers, it’s really quite a clean city, whereas Xiamen is unfortunately much dirtier. It’s a shame; the weather is great and it’s such a touristy place, you would imagine they would keep it cleaner. Xiamen is definitely more expensive. Rent is also ridiculously expensive… but also food and drink also costs more than Chengdu. Also, during the Summer, they increase the prices of things for tourists. We got charged more for bananas we bought at a stall because we were ‘tourists’. I was really surprised to find out that there were not many foreigners in Xiamen. Instead it was bustling with Chinese tourists, mainly from Taiwan. I heard that many Westerners leave Xiamen during the summer, but to me it was strange not to see many. 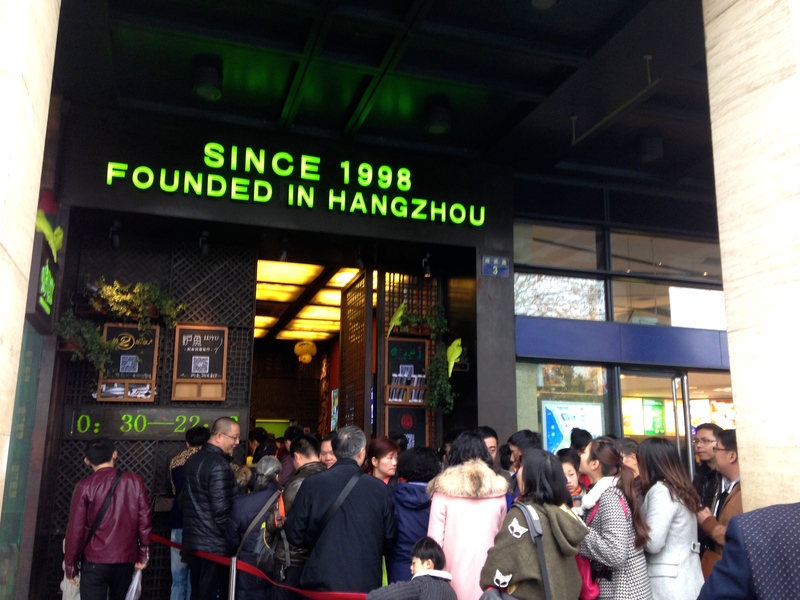 There are increasingly more Western people coming to Chengdu, so you are bound to see one now and again. Because Chengdu is in the West, the people there are kind of sheltered from the influences of the Western culture. This means that they are still sort of surprised when they see a Western person. They would rather shout “HALLO” to you when they have actually passed you….instead of saying it directly to you. In Xiamen, they are definitely not afraid to try and speak English to you. They are braver. I thought Chengdu had a lot of fruit.. but Xiamen definitely has more.. and it’s more delicious! 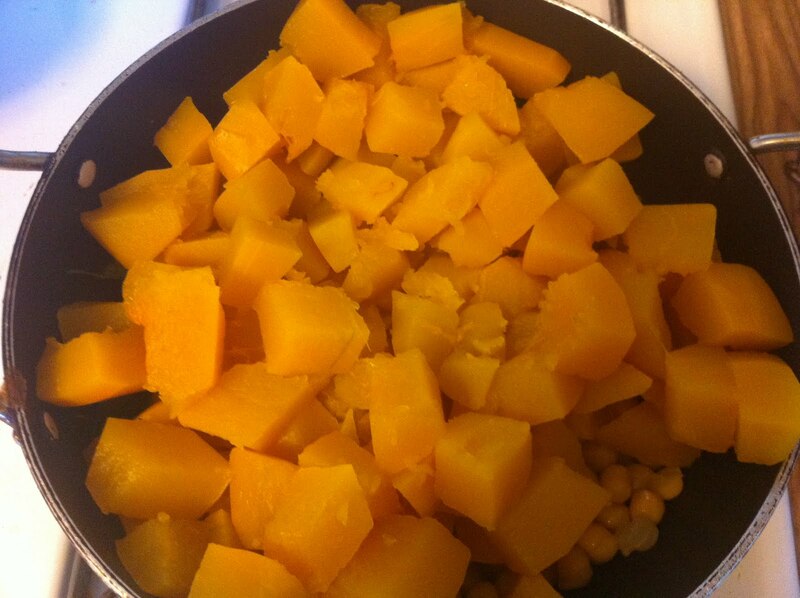 The mangos are huge…. and they have a much nicer juicier taste. Also the bananas taste much better. I think because many Chinese tourists visit Xiamen, both myself and my boyfriend have noticed that the Chinese people there look different to the people in Chengdu. In Chengdu, they have rounder faces (I think anyway), whereas in Xiamen, they have a different looking face. I’m not sure how to explain it, but a lot of women have more oval faces… they just look different to Chengdu people. I’m guessing it’s because there are a different mix of people in Xiamen. Chengdu is overflowing with e-bikes, we also have one too…. because they are just so handy and cheap to get around with, and because the ground is flat, e-bikes are everywhere. In Xiamen, there are not as many. I think Xiamen has a different regulation with having an e-bike, so not as many people have them. From what I’ve seen, it’s usually just for people who have a business; so they can transport their goods easier. I missed Sichuan food so much in Xiamen! And no Hot-Pot to be seen! 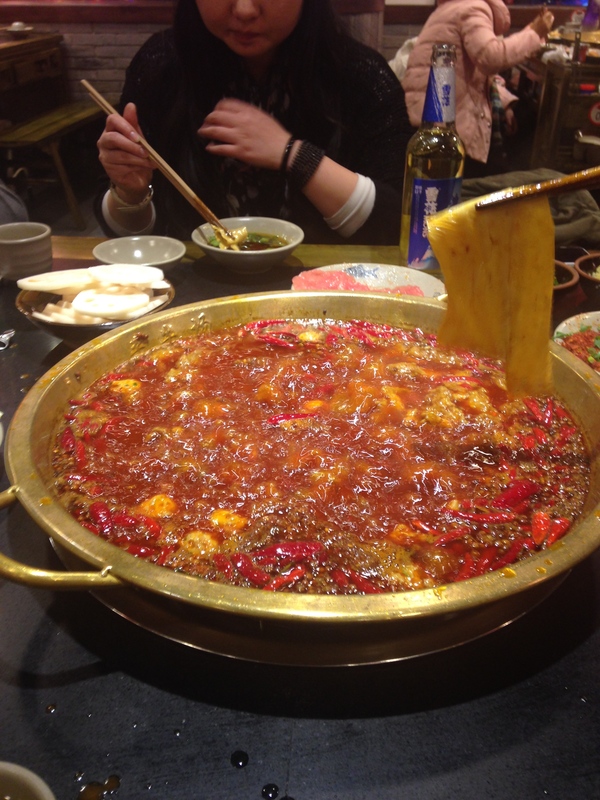 For people who don’t know what Hot-Pot is, it’s a large pot with simmering oil and spices. You put different food into it to cook it in the spicy oil; like sliced potatoes, boiled eggs, meat. It’s great to eat during the Winter. In Xiamen, there was no Hot-Pot restaurant to be seen. That is one thing that I will miss if I move to Xiamen. 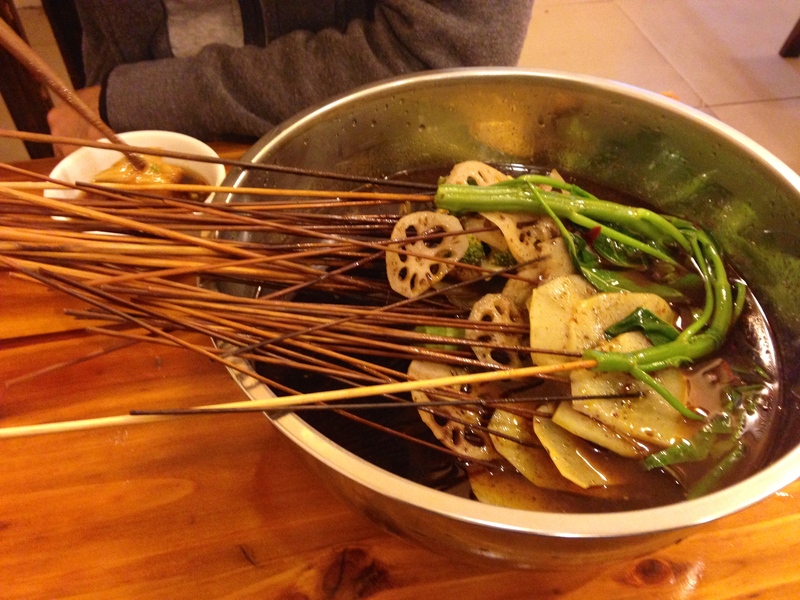 Coming from Sichuan, where most of the food is spicy…to eating sweet food from Xiamen is quite strange! They prefer to eat food that is more sweet in taste. The food really reminded me of the Chinese food I would get from our Chinese take-away shop in Ireland. The taste is really similar. In Xiamen you could order ‘Sweet & Sour Pork’, whereas in Chengdu you would never see that on the menu. Also, the food in Xiamen is not as oily as in Sichuan. Sichuan food can be too oily sometimes. One thing that really surprised me was that shops in Xiamen would play Western English music. It was so weird to hear! In Chengdu, you rarely hear English music… they always have Chinese music playing in the background. I’m not a huge fan of Chinese music… so it was nice to hear English music being played in shops. There are too many people in Chengdu! Everywhere you walk there are people. Compared to Chengdu, Xiamen is so so quiet! You could walk in a park and not meet one person the entire time. It was great walking around the island. No Tea-houses in Xiamen. We were walking in a park and I noticed ‘Huh… there are no tea-houses here’. In Chengdu, you could find 4/5 of them in one park; people sitting for hours drinking tea and chatting or playing Mahjong. In Xiamen however, this tradition simply doesn’t exit. Those are some differences that I noticed between the two cities… If I remember any more I will add them. Xiamen is a much more beautiful than Chengdu, but Chengdu has more charm I think. It is more traditional and has kept more of it’s old culture than Xiamen. Xiamen has become more Westernised. I love both places in different ways! Semester 1 is officially over. The months flew and thankfully I’ve learned quite a lot; now quite a lot means asking and answering about your family, talking about yourself, what you want to order, directions among more, so quite basic stuff. But i’ve also leaned some grammar and my listening has improved quite a lot! We also had our exams which I was very happy about, some minor mistakes with my characters (what a surprise) and I was a tad nervous with my oral speaking; talking about how I like dogs, cats, pandas and bears (they are the only animals I know) and how I don’t like Chengdu’s weather. I now know where my level is at. Now I just need to start getting private classes for my oral speaking, as this is my weakest point. When it comes to the speaking, thats what messes me up! Before Uni, I was a bit more relaxed about speaking, but now, I know how important the tones are, I know that if I don’t pronounce something wrong they don’t understand me, and I’m definitely more conscious of myself speaking. So, I’ve basically become that student that doesn’t talk outside of class. When we come back from Ireland I want to try and get started in August, and hopefully this in time will improve. Other than that, nothing else is happening, I’m still teaching my students, something that I was surprised about! I know 3 groups want to stay with me which is good. I definitely don’t want 2 groups though; one is a girl and just doesn’t want to learn anything except do her own thing and of course watch Peppa Pig. She’s on a “10 stars = Peppa Pig” system, but I get a little stuck when she doesn’t get those 10 stars so I be a little lenient with her. I only have her once a week for 1 hour, so if they just take that 1 hour out of the week then I don’t mind teaching her at all! 🙂 Then the other group is with two 11 year old boys. One is fine, the other is mad, blowing balloons in the class, eating paper, not sitting down and not being able to concentrate. Their English is very bad for their age, so they really should listen in class. So if they get rid of the mad boy then teaching the other one is great. But unfortunately that’s not the case. So thats the other group I don’t want. I hope to organise my classes with them so that I can work 3 days a week instead of 4, as I will have some extra hours on Saturday in my old campus, plus I want to study my Mandarin more. From the second semester book there are more characters to learn! It’s a never ending battle! So if the PA’s do that I’ll be very grateful! Also, there are 7 days until home time. At this stage I’m getting fed up with the waiting. I can’t imagine the wait expectant mothers have, 9 months! But I know the week will fly by, with no Uni and just working, Wednesday will come around quick enough. Weather in Ireland seems ok, so I’m just hoping it will continue while we are there. But I really don’t want to think about coming back to China. Aw I know it’s going to be bad….. But lets not think about that for a while! My favourite food and drink in China. Having lived in China for nearly two years, I’ve picked up my favourite food and drink here. Sichuan is of course, famous for its cuisine, and it being spicy, It’s a good place to try out new food. Some of these photos are my own which I took while here, some from the internet. Lately I’ve been craving Hot Pot! A little less so now though, as the temperature is usually in the 30’s, but when it was colder It was something that would definitely warm you up. I usually love veg and beef, but a lot of Chinese people add strange things into theirs that I wouldn’t be fussed on. We once got sheep brain ( I think it was sheep) and I did actually try it. The consistency is squishy but I didn’t really enjoy it. The plain food will do fine for me! Here we just got the spicy one, but you can get half spicy and half non spicy if you like. I love these, although eat a few of these and you’re full! Here there are two kinds, one thats are boiled, and ones that are fried. I prefer the golden ones because they taste sweeter. Really they are just sweet bread. In the middle you have like a custard dip. They are served hot, because as soon as they start cooling down they become hard and they are difficult to eat. Most foreigners order this dish. My chinese friends always say ‘Foreigner people love this dish!’ It’s true though. 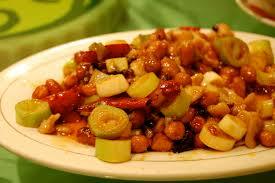 It’s not typical Sichuan, as this is sweet, with chicken cubes and peanuts. We order this quite a lot, although some times we have gotten it without the peanuts. I’m guessing they run out. I only know one cold dish and this is it. This is very spicy and sour. I think the juice is a type of vinegar. You definitely need a drink when eating this. When a Chinese friend ordered it I thought ‘What the hell is this?’. Add to the fact that it was cold, I wasn’t particularly excited to try it, but I was surprised by how much I enjoyed it! I’ve only recently tried pumpkin here in China, but I think we’ll be ordering it more often. It’s nice and sweet, I sometimes get confused what exactly it is, as it tastes similar (in my opinion) to sweet potato. In Ireland, from what I gather, we don’t eat pumpkin. I love these bāozis. 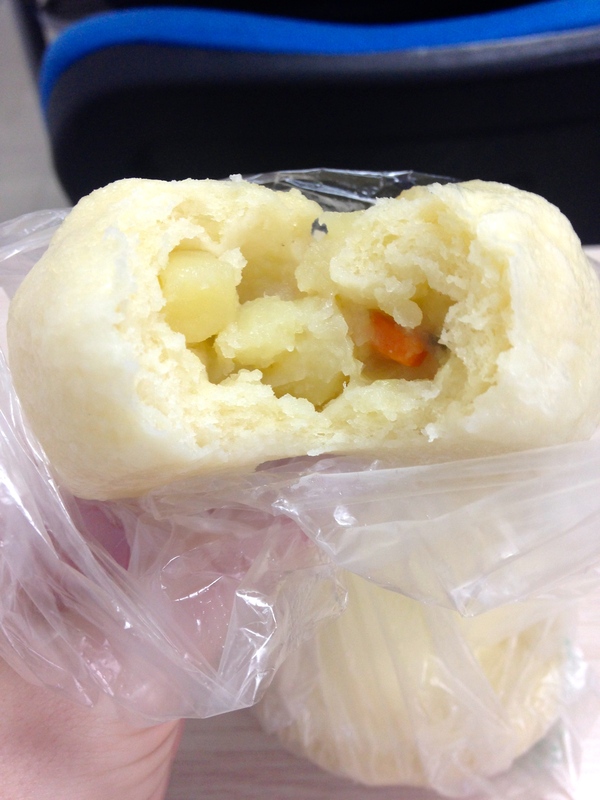 The usual fillings are pork or beef, which although are nice, I much prefer the buns filled with potato. I think the meat filled ones taste too strong and they repeat on me. I’m not sure if the potato ones are common in China, but I’ve only seen them in one bāozi stall. Every morning before Uni we buy one of these for breakfast. My boyfriend says that I am addicted to these. Which I am not! I treat myself to one only once a week. 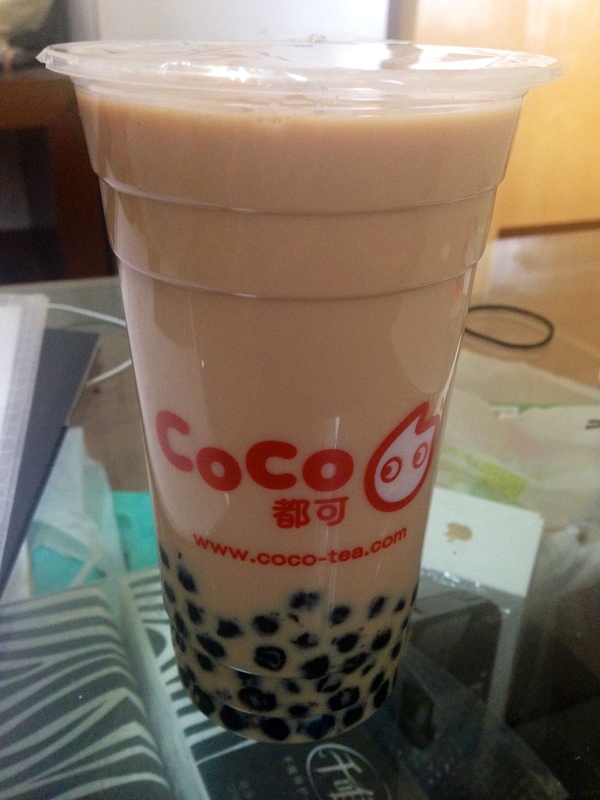 Surprisingly, the first time I had a milk tea I didn’t like it. The teenagers from my old Uni I worked at were all shocked when I told them I didn’t like milk teas. Now I’ve come to love them, especially the ones from Coco, originating from Taiwan. Milk teas are very popular and you can get different things in them, like pudding. I know, I don’t understand why they put pudding it them either. The one I like is the tea with the black pearls. 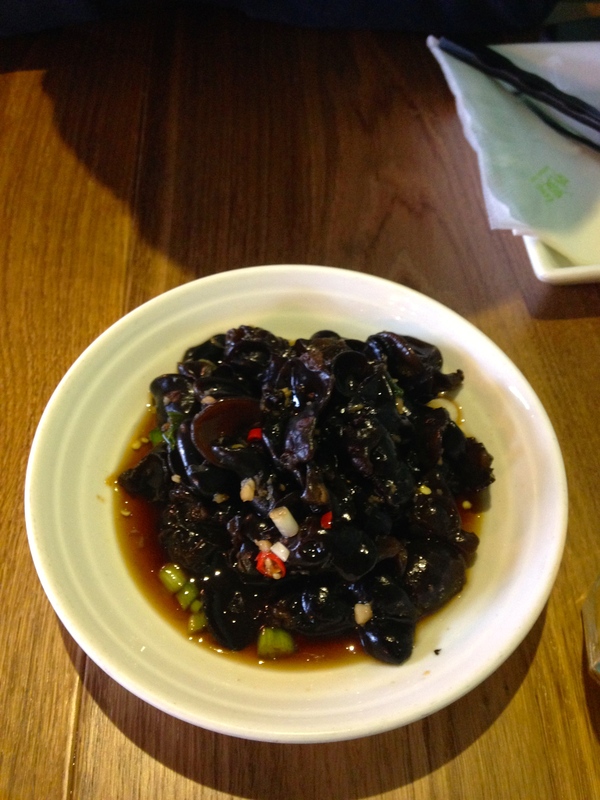 They are black jelly like balls at the bottom. I never before seen this in China, but our friend from Uni showed us this shop that makes these. 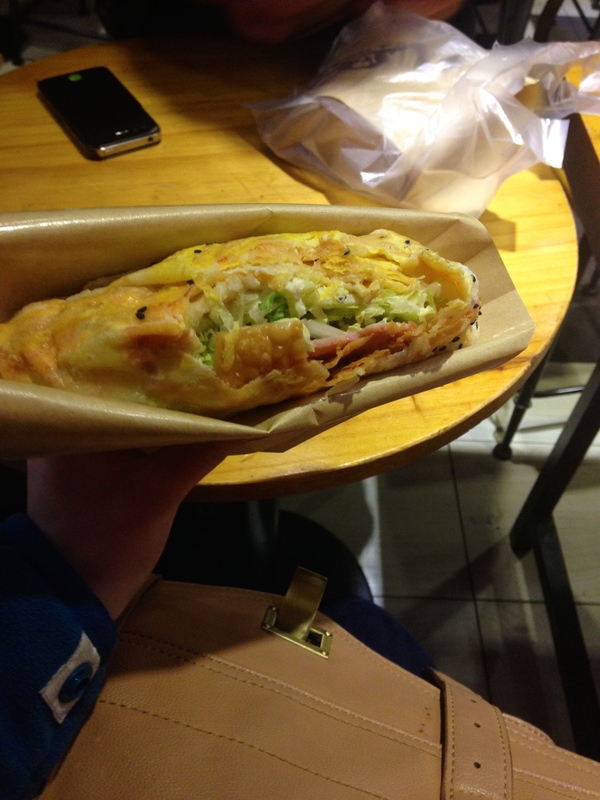 I call it a Chinese crepe. Apparently they are eaten in the morning. They put different things in them, in this one there is a spicy sauce, lettuce, mayo, ham and these crunchy cracker things. Being quite big, you could just eat this and you will be full. We usually get these after Uni for lunch. chuān chuān 串串 Stick Hot Pot. I particularly enjoy this food. They cook the food and then put it in a pot for you; sometimes you can eat it like hot pot, with the the boiling pot, but here we get it cooked. 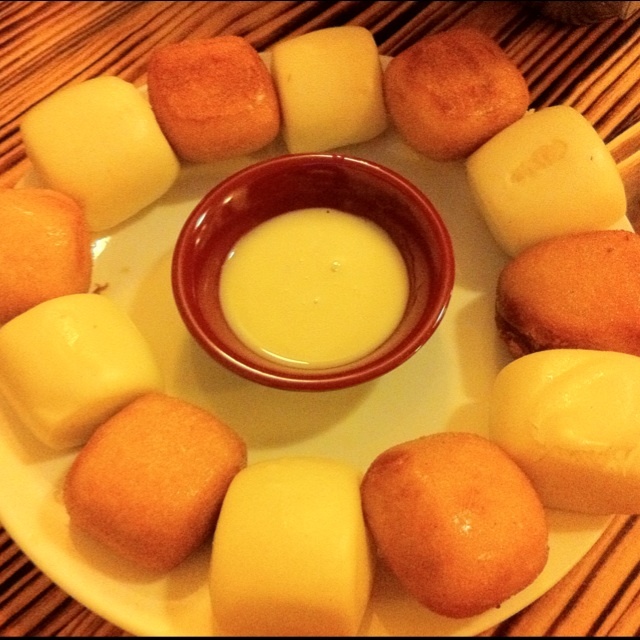 For dipping sauce, you can get it dry; with just spices, or with oil; when the spices are in a bowl with oil. We prefer it with the oil. We’re not too fond of the meat in these places so we just get the vegetables. We know one unlucky soul who got very sick when he ate the meat from it. So these are some of the food and drink I eat and drink regularly here in Chengdu. Maybe if you come to visit Sichuan you can try these dishes. I have more of my favourites but i will do another post on them another day. My top tips when visiting Hangzhou! Here I’ve compiled some tips for anyone who may be considering visiting Hangzhou! 1. For accommodation, stay at the ‘Mingtown International Youth Hostel’. It’s literally next to the West Lake, rooms are clean and there is a bus stop and bike rentals nearby. Mingtown International Youth Hostel Hangzhou. 2. See the cities light and water fountain show. This is held in the evening on the west lake, with the show taking around 15 minutes. 3. Eat at ‘Grandmas Home’. There will always be a queue of people getting inside, but don’t be deterred. When you finally get a seat, the restaurant is modern, english menu with pictures, delicious food, and its cheap! It serves Hangzhou food but there is a Sichuan section too, to our delight! You need to get a ticket before hand, then when they have a table ready they will send you a text to tell you. For us, we waited maybe about 1 hour for a table, but it was worth it. But don’t go in the evening, as it is far too busy and the tickets may be sold out. Grandmas Home. Look at that queue! 4. Rent a bike. 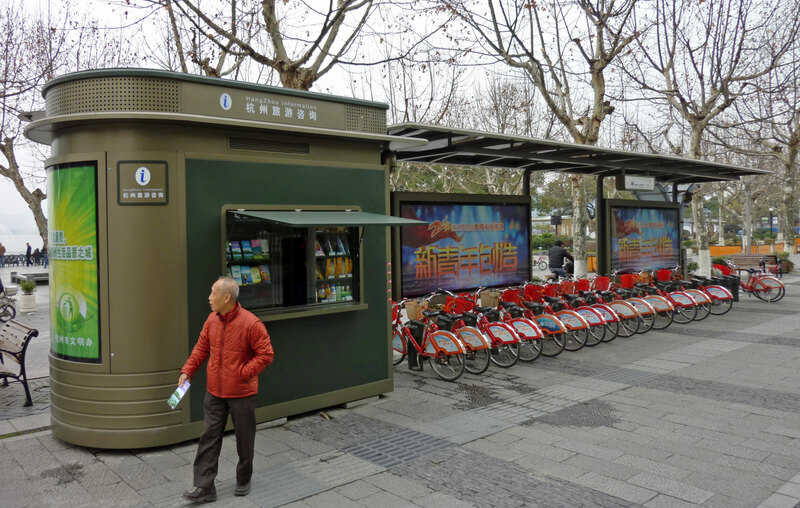 Because Hangzhou is a touristic city, there are many places to rent bikes. You will see red rental bikes everywhere. Go to a bike kiosk and they will give you a card in exchange for money. It allows you to use any bike available in the bike stands. Then when you return the bike to a stand, press the card against the machine and the it will lock. But don’t forget, bring your passport when getting a card as they will need it. Hangzhou is a city designed for cycling, so it is quite a safe place. Renting a bike is cheap and easy. 5. Be aware of scenic routes. We were blissfully unaware about how big Hangzhou’s scenic routes are! We decided to visit a temple, wandered onto a path, and ended up walking up a huge mountain to the top! I thought ‘aw sure we’ll see where this path leads us, probably to another temple’. I didn’t know it brought us up a mountain!! Although at the top there was a nice viewing point, if I’d have known before hand would’ve been good. So be wary when walking, scenic routes are long, sometimes leading you miles away from your starting point. 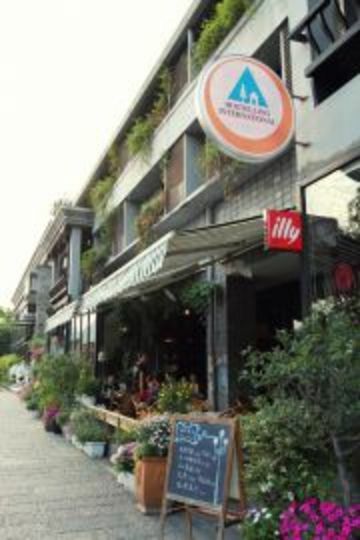 6.Visit heifang street. It’s a tourist street with loads of small markets selling all sorts. Try out the ‘beggars chicken’ being sold there. 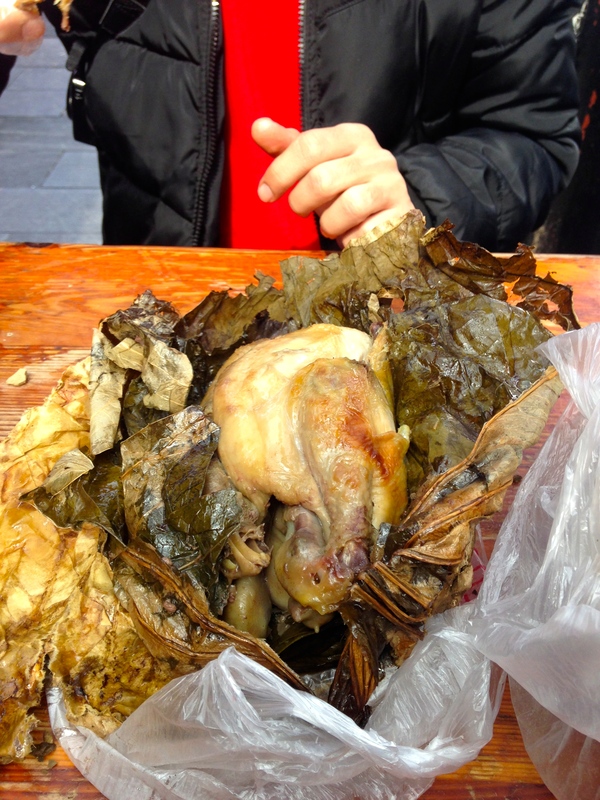 It is a whole chicken wrapped in leaves that is then baked in clay. Hard to eat, but tastes sort of like a lovely roast chicken. Beggars chicken. It tastes nice than it looks! 7. Visit ‘Slims New York Steak & Burger.’ We came here about 4 times because It was a 5 minute walk from the hostel. It serves delicious burgers (and presumably steaks but we only ordered the burgers). They serve proper meat which makes all the difference. Although be warned, the staff aren’t the friendliest, but never mind them, just enjoy the food. 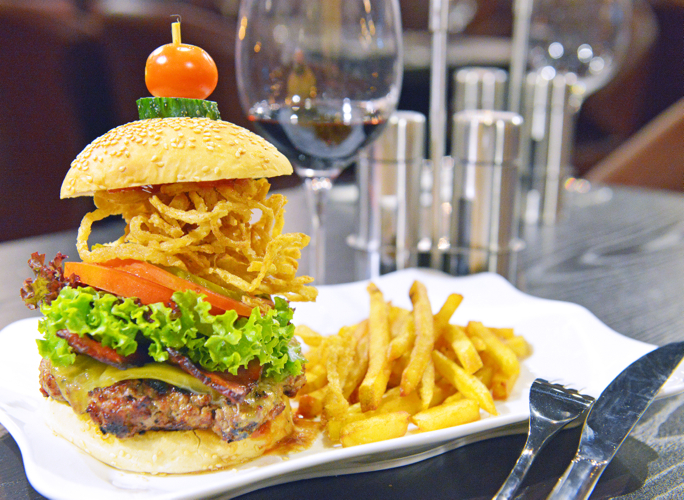 Delicious burger with real meat. I think that sums up my tips for Hangzhou. We were there 10 days and we still didn’t see half the things that are in Hangzhou, so there are plenty of things to do. Useful apps when in China. 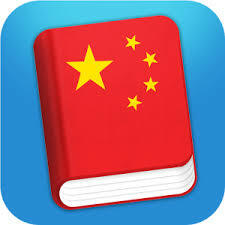 Whether you are just visiting China, or planning to stay for a little longer, apps are extremely useful. Here are a list which I, and many other people in China use. They will make your stay in China that much more enjoyable. I use these apps through my iPhone, so you may have to check what other phone versions can use these apps. Baidu is the Google/Yahoo/Bing of China. Many Chinese search through this search engine. 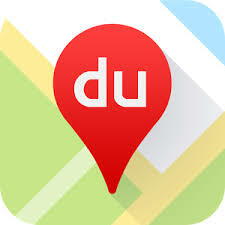 Unlike Google, you do not need a VPN to access Baidu. *TIP: To listen to free music, type ‘baidu music’. *TIP: Get a Chinese person to help you out with the app at first. It is all in Chinese so get to know the basic layout and then you’re flying. Before Google was blocked, this was very useful. To use it now however, a VPN is needed. Once you have this it is useful in translating long sentences rather than just words. Great for procrastinating, this app allows you to watch both TV series and films…. for Free! Yes, Chinese people are lucky enough to enjoy unlimited free music, TV series and films. Simple type in whatever series you want to watch, or look for the icon that shows movies ( a movie reel) where you can watch both Chinese and Western movies. *TIP: On certain phone types, you can download a film or series to watch later, not needing an internet connection. Unfortunately I could not use this function on my phone. I personally find this Chinese language learning app particularly useful. On it, it includes Greetings, General Conversation, Numbers, Time & Date, Directions & Place among other useful things. I decided to buy the whole app, which includes Countries, Family and Dating. It shows you the English and Chinese translation with a clear audio translation. You can also slow down the speech to help you more. 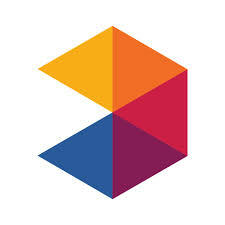 *TIP: This app is good for pronunciation, where you can listen and repeat and achieve more fluency and natural speaking. I’m sure anyone who has searched for Mandarin character learning is familiar with this app. The main purpose for this app is to teach you the Mandarin characters, which are notoriously difficult. Beside each character, it shows you a picture relating to the character, making it easier to remember. Whats more, its free. *TIP: This app can be used on your phone and also through a computer. How Memrise helps you relate the character to the meaning. For teaching or for learning Chinese, this app is brilliant. I use this for a lot of my classes. Basically a dictionary, it allows you find vocabulary in English and Chinese. To search for something in Chinese, simply type in the pinyin of the word and all the meanings appear with the Chinese character translation, with a listening element if needed. I personally don’t like this as the voice is computerised and the younger students do not understand it anyway. You can buy it for more functions, but the free version has everything I need. Somewhat like MSN messanger, this app basically allows you to send messages to Chinese and Chinese expats. 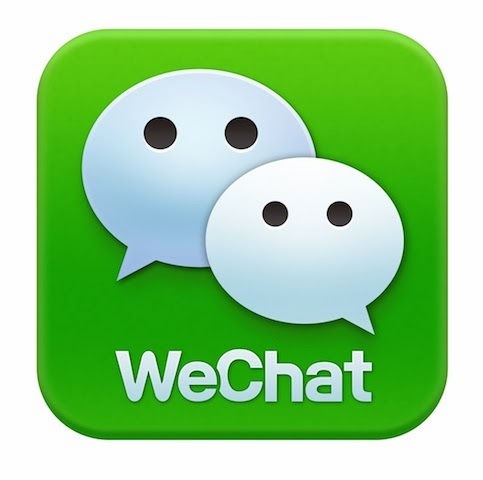 Almost everyone in China has a WeChat account, meaning it is a must if you decide to live in China. You can look at other peoples page, post pictures and statues on Moments. It also has a function where you can translate a message from Chinese into English. A must if you have Chinese friends that don’t speak English. You can also send a voice message, which the Chinese people I work with love doing. So these are the apps that I use regularly and those that I feel worthy to write about. All are free, with additional add-ones if you want to pay. I hope this post helped some people planning on visiting or moving to China.